If you ever go to The Hall of Five Contemplations for lunch (which, if you like to eat Chinese food and/or need more serenity in your life, you absolutely should), be sure to dress conservatively. It is, after all, in a Buddhist monastery. 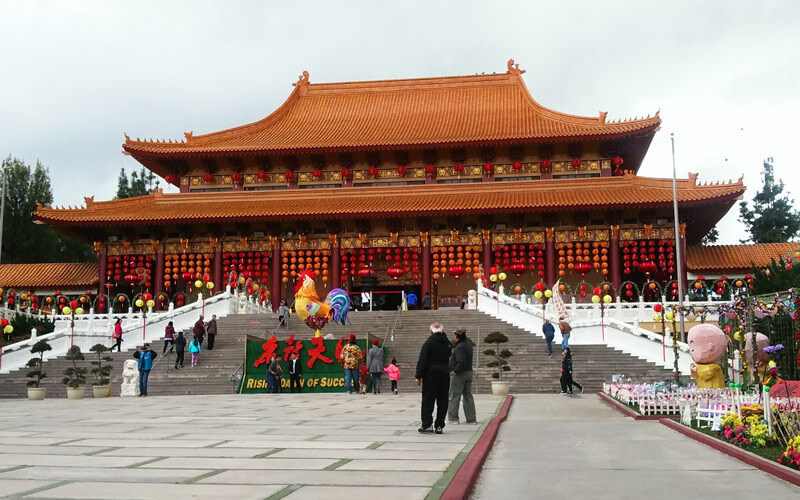 Hsi Lai Temple, the 15-acre Hacienda Heights campus of Taiwan’s Fo Guang Shan Buddhist order, is dominated by a bronze-roofed shrine bedecked with red and orange lanterns. 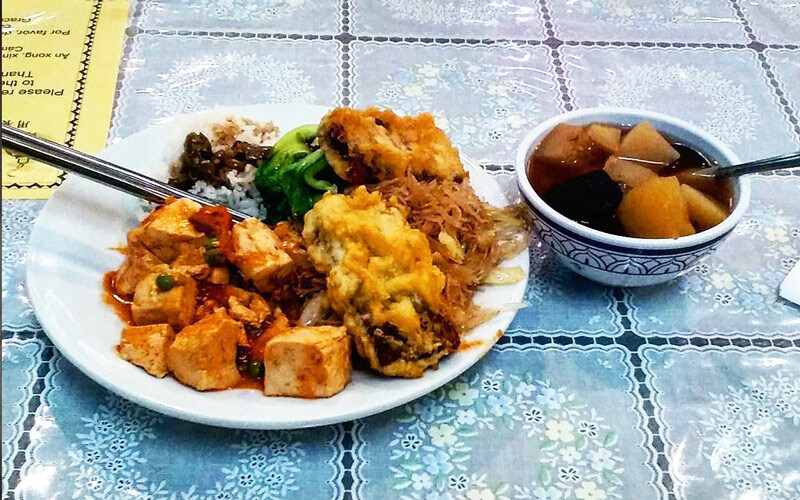 Beneath it there’s an unassuming vegetarian Chinese dining hall you could easily miss, and it’s open to the public. It’s a pragmatic space—tables draped with clear plastic, florescent lights overhead—that primarily exists for those attending the temple. All are welcome, though, and eight dollars buys you all you can eat. 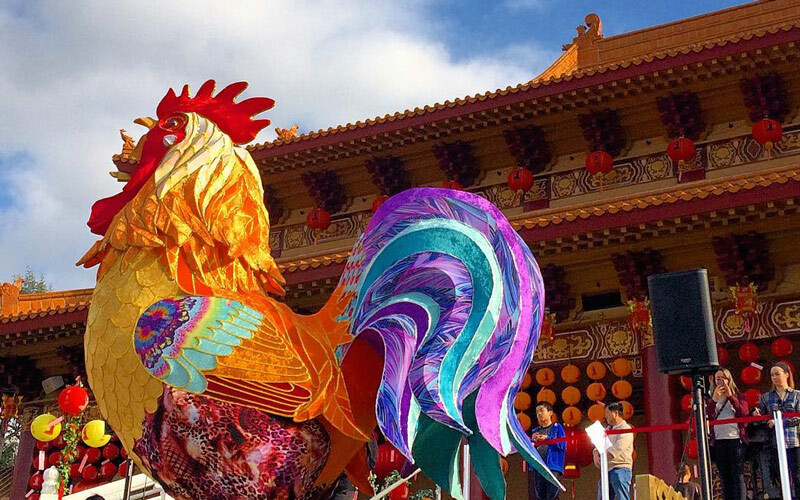 The menu changes with the seasons and varies pending food donations, the temple’s director, Yi Shan told KCET. Dishes eschew an over-reliance on seasoning and avoid pungent roots like garlic and onion that are deemed too potent. Cubed turnips or gourds might simmer in broth alongside steam trays of cauliflower curry or yams. The tempura vegetables—be they mushrooms or squash–are especially good, freshly fried and light on grease. Dumplings, potatoes, egg rolls, stir fried daikon, or bok choi might round out a menu of no frills vegetarian food. And though the selection varies, you can count on consistent seitan, tofu, rice, chow mein, and soup—and maybe some imagawayaki for dessert. It’s a low-key serve yourself/clean up after yourself situation with just one rule: Don’t waste food. Previous articleCan a Rapid Transit Line Save Messy, Perilous Vermont Avenue?